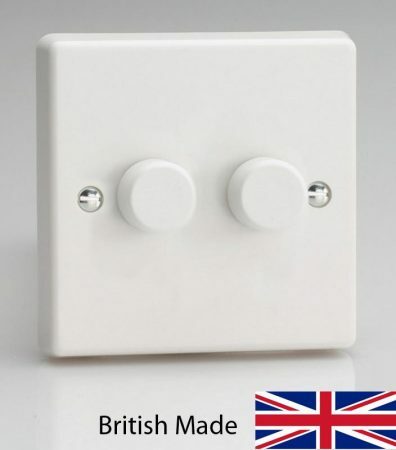 This Varilight V-Com 2 x 180w LED 2 gang rotary dimmer switch in white is made in Britain and supplied with a manufacturers 10-year warranty. Featuring intelligent dimming technology, soft start, intelligent overload protection, adjustable minimum brightness setting and choice of modes for up to 20 lamps per dimmer. This V-Pro dimmer switch is leading edge by default and features three driving modes. These modes can be changed simply and quickly by following the programming instructions shown in the user instructions. Push for on / off and rotate to dim. Please follow this link to view or download the user instructions. Also available in a variety of finishes including but not limited to polished chrome, satin chrome, antique brass and bronze; please contact us to enquire about other finishes.